NASA and University of Michigan scientists have discovered a massive cloud of methane that spans 2500 square miles (about the size of Delaware) located above the the Four Corners intersection of Arizona, Colorado, New Mexico, and Utah. The atmospheric methane concentration of methane in that area is equivalent to 1.3 million pounds of emissions a year, which is 80% higher than EPA estimates. This is the largest concentration of methane in the United States. 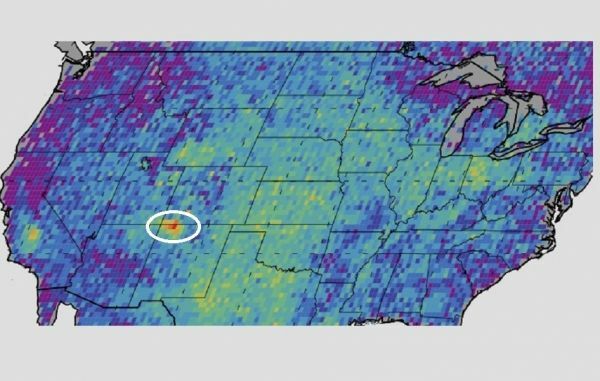 It was so large in fact that scientists “weren’t sure if it was a true signal or an instrument error,” but they recently verified the levels of methane in the affected area. Eric Kort of the University of Michigan, Ann Arbor attributed the dramatic methane emissions to leaks in natural gas production and processing equipment in New Mexico’s San Juan Basin. The San Juan Basin is the most active coalbed methane production area in the US. The coalbed methane covers the pores and cracks in coal. As this methane seeps out from underground coal mines, it causes fatal explosions almost yearly. While the methane concentrations in that area are not an immediate health risk to the local inhabitants, it has significant implications for climate change. As a greenhouse gas, methane is 86 times more potent in its atmospheric effect than carbon dioxide in the first two decades after release. 25% of human-induced global warming is caused by methane emissions in the environment. As the U.S. considers transitioning from coal to natural gas as a means of reducing greenhouse gas emissions, it is critical that accurate assessments of leaking methane are accounted for in all calculations. If leakage of natural gas isn’t greatly reduced, switching fuels may make little or no difference in combating climate change. This methane hot spot should serve as a warning that other undiscovered leaks are probably out there and having a significant impact.